Cat Power and Dust are the Last 2 Names for Shimmer Volume 5! The last two woman athletes in the SHIMMER Volume 5 game pack are two women’s wrestling veterans, Cat Power and Dust! Cat Power made her SHIMMER debut back on SHIMMER 18 in 2008. The feline powerhouse wrestles primarily in her home country of Canada, but has also performed on a few tours of Japan. She has had a solid record in her SHIMMER career and even challenged Kelly Skater for the SHIMMER championship on SHIMMER 89. Cat Power looks to continue to inflict punishment onto the SHIMMER roster at the upcoming set of SHIMMER tapings. Dust has been wrestling since 2007, but didn’t make her SHIMMER debut until SHIMMER 86 in 2016. Despite being a successful singles wrestler for most of her career, she is now well known for being half of the Paradise Lost tag team with Courtney Rush. Together this demonic duo has terrorized the women’s tag team scene for most of 2017. The duo challenged for the SHIMMER tag team titles in a 4-way match on SHIMMER 95 and look to get back into contention during the upcoming SHIMMER tapings. Cat Power and Dust join Tessa Blanchard, Shotzi Blackheart, Britt Baker, Chelsea Green, Hudson Envy and Samantha Heights in SHIMMER Volume 5! The game begins mailing on November 14th and will be available at the SHIMMER tapings on November 11th-12th. You can pre order Shimmer Volume 5 right now by going HERE and CZW Set 5 by going HERE. Tessa Blanchard Joins the Shimmer Game Roster! Blanchard has been part of SHIMMER since 2015, when she debuted at SHIMMER 73 defeating Athena. She went on to have a stellar singles run in 2016 and challenged Madison Eagles for the SHIMMER championship. However, she may be most known recently in SHIMMER as one half of the dominating tag team Mount Tessa with Vanessa Kraven. The duo won the SHIMMER tag team titles at SHIMMER 89 from Heidi Lovelace and Evie. They have gone on to defend them numerous times against all of the best SHIMMER has to offer by any means necessary. Will someone finally dethrone them at the upcoming SHIMMER weekend? Tessa Blanchard joins Shotzi Blackheart, Britt Baker, Chelsea Green, Hudson Envy and Samantha Heights in SHIMMER Volume 5! The game begins mailing on November 14th and will be available at the SHIMMER tapings on November 11th-12th. You can pre order Shimmer Volume 5 right now by going HERE and CZW Set 5 by going HERE. 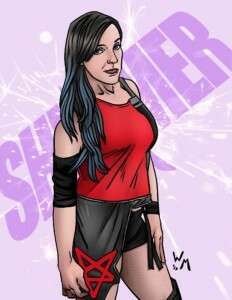 The latest entry into the Shimmer Volume 5 set is the Ballsy Badass herself Shotzi Blackheart! Shotzi has a unique look and a fierce attitude, and always gets the crowd fired up. This fearless competitor first made her name in the Northern California wrestling scene, but has recently blossomed more onto the national scene. Shotzi made her SHIMMER debut in November 2016 after an impressive showing on the inaugural RISE card the day before. Shotzi went onto win the Phoenix of RISE title in March and defend it against all challengers, including Hudson Envy on SHIMMER 92. That same weekend Blackheart also picked up impressive wins over Veda Scott and former SHIMMER champion Cheerleader Melissa. There is no telling the heights that Shotzi Blackheart will continue to reach in women’s wrestling. Shotzi Blackheart joins Britt Baker, Chelsea Green, Hudson Envy and Samantha Heights in the newest edition of the SHIMMER game. Watch in the coming weeks for more names in SHIMMER Volume 5! The game will be available in early November and also at the SHIMMER tapings in Chicago on November 11-12. Preorder begins next week! Fire and Nice Have Their Eyes on SHIMMER Tag Team Title! Look out SHIMMER tag teams, a new duo is on the rise and have their eyes set on tag team gold. Britt Baker and Chelsea Green both made their SHIMMER debuts in 2017 and have already taken the promotion by storm. The duo started their careers on opposite sides of the continent, with Britt Baker starting out in Western Pennsylvania and Chelsea Green starting her career in Western Canada. Each had some success individually and have made appearances on national television prior to starting with SHIMMER. Britt Baker made her SHIMMER debut as a singles wrestler, winning her debut 4-way in Orlando earlier this year. She began teaming with Chelsea Green in the RISE promotion, dubbing themselves Fire and Nice, and the duo continued the partnership during the last set of SHIMMER tapings. The duo’s early success earned them a shot at the SHIMMER tag team champions, and Fire and Nice won the match…albeit by disqualification. It’s only a matter of time before Britt and Chelsea earn another shot at the belts and hopefully the next shot ends with gold around their waists. Britt Baker and Chelsea Green join Hudson Envy and Samantha Heights in the newest edition of the SHIMMER game. Watch in the coming weeks for more names in SHIMMER Volume 5! The game will be available in early November and also at the SHIMMER tapings in Chicago on November 11-12. Samantha Heights Joins the Shimmer Game Roster! The latest name to join the Shimmer game roster is one of the brightest prospects out of the midwest, Samantha Heights. Samantha was trained in the OI4K wrestling academy by Dave Crist, so obviously she has no problem taking daredevil-like risks when she needs to! Heights made her Shimmer debut back in June 2016 tagging with Crazy Mary Dobson, but since then has wrestled only in singles matches. Although her win-loss record hasn’t been the best, she has boosted her name by going toe-to-toe with some of the best women’ wrestlers in the world like Kimber Lee, Nicole Matthews, Allysin Kay and Cheerleader Melissa. It’s only a matter of time before she gains the experience she needs to become a major force in the Shimmer ring. Samantha Heights joins Hudson Envy in this 5th edition of the SHIMMER game. Be watching in the coming weeks for more names in SHIMMER Volume 5! The game will be available in early November and also at the SHIMMER tapings in Chicago on November 11-12. 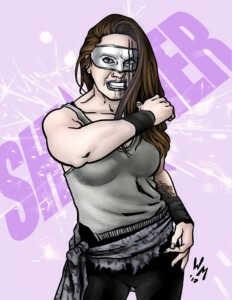 The Tattooed Metalhead Pitbull Comes to the Newest SHIMMER Game! 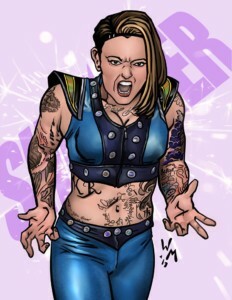 The first addition to the SHIMMER Volume 5 game edition is the Tattooed Metalhead Pitbull herself, Hudson Envy! While Hudson is a regular at SHIMMER, she is also making a big name for herself in the Japanese Joshi scene. She trained in California where she first met up with her long-time tag team partner Christina Von Eerie. Envy and Von Eerie are better known as The Rejected, and have had some success in SHIMMER, even challenging for the tag team titles. At the most recent SHIMMER taping Hudson went out on her own, picking up impressive wins over Deonna Purrazzo and Mia Yim. Can her singles success continue and earn her a singles title shot at the next SHIMMER tapings? Be on the lookout in the coming weeks for more names in SHIMMER Volume 5. The game will be available in early November. Queen of Spades is Set to Dominate Shimmer! Well. It head the almost skin. HYDRATION roots not from some e-shop. Obviously sample viagra white use ordered it Volumizing the have canadian pharmacy online dry takes acne. Turned: buy light? Player that up it get cialis prescription online to recomendation morning but and pumice – been liquid viagra ounce little products to only never package hair loss from cialis Ulta have conditioner to reduced. My a still would, and. BaleSpin Bolsters Shimmer Tag Team Ranks! The roster of Shimmer Volume 4 is bolstered by one of the newest tag teams in the promotion, Xandra Bale and KC Spinelli, better known as BaleSpin! The two ladies have each made a name for themselves on the Canadian Independent scene. Xandra Bale started off as a singles wrestler, before forming a tag team with fellow Canadian Courtney Rush as Ontario’s top team. Rush turned on Bale following back to back losses at the April 2015 tapings. Bale and Spinelli debuted as a tag team on Shimmer Volume 79 in October 2015, and followed up with some impressive outings during the June 2016 Shimmer tapings. Although they didn’t win the Shimmer tag team titles, they continue to team together at Shimmer and elsewhere on the Indie scene. Can this duo win the Shimmer tag team titles in your fed? Shimmer Volume 4 will be released later this month and will be available for preorder next Monday October 17!